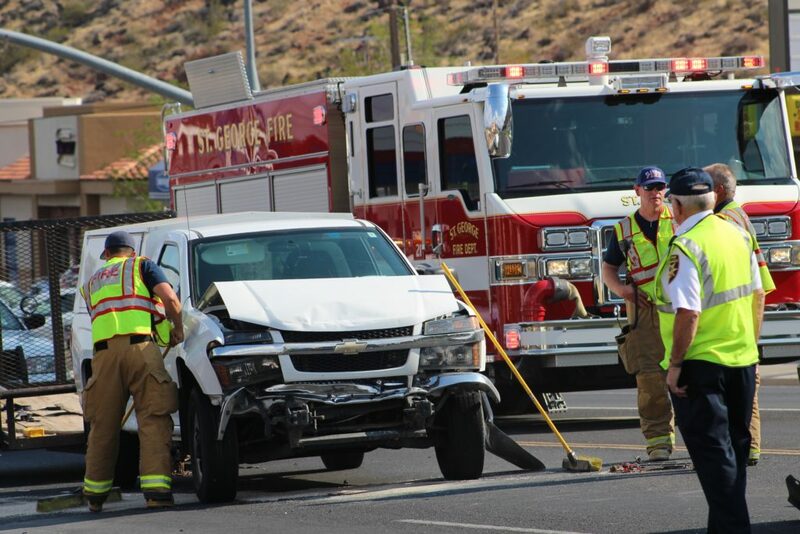 ST. GEORGE — Two crashes that occurred seconds apart on Bluff Street during rush hour traffic Thursday left four vehicles damaged and several people with minor injuries. Just before 4:30 p.m. emergency responders and officers were called to N. Bluff Street near 300 North, St. George Police Sgt. Choli Ence said. Upon arrival officers found four vehicles smashed together in the northbound lane with several people standing outside of the cars. 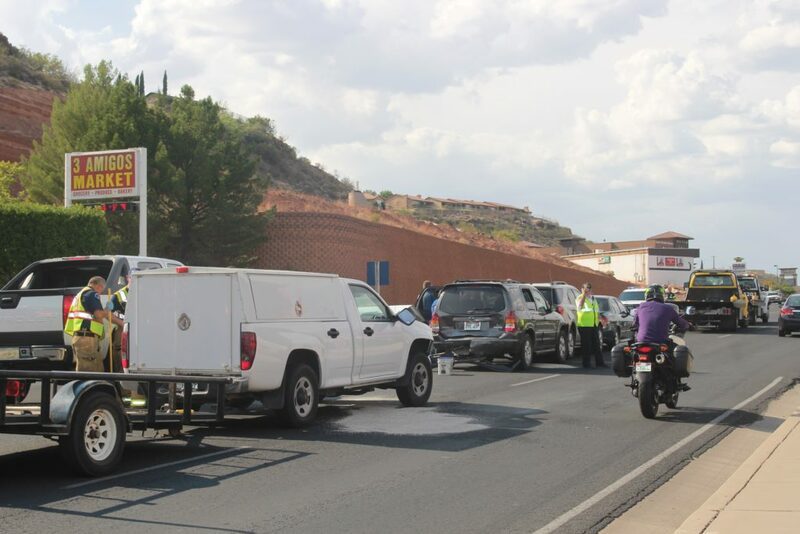 During the investigation officers determined that what appeared to be a four-car crash was actually two separate collisions, Ence said. 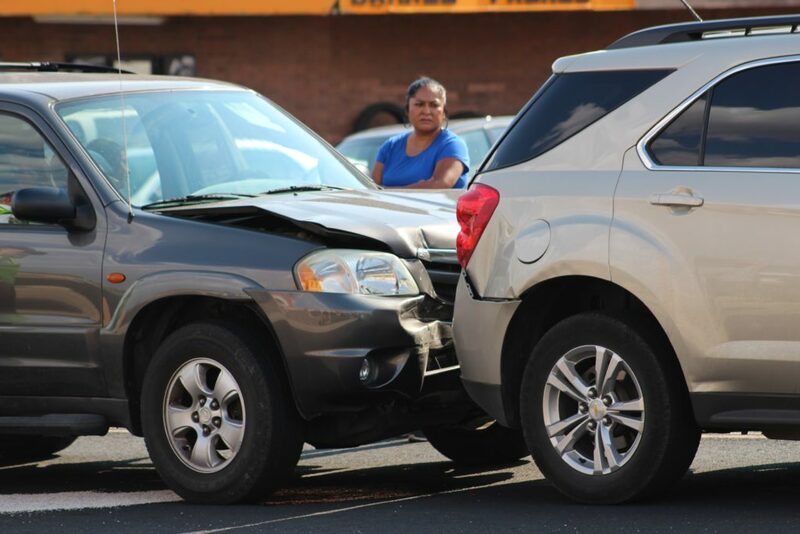 The first crash occurred between a green Honda Accord and a silver Chevrolet Equinox. The woman driving the Honda was stopped at 500 North on Bluff Street when the traffic light turned green. Just as the woman released the brake to proceed north on Bluff Street her car struck from behind by the Equinox. That collision disabled both vehicles in the left hand lane. 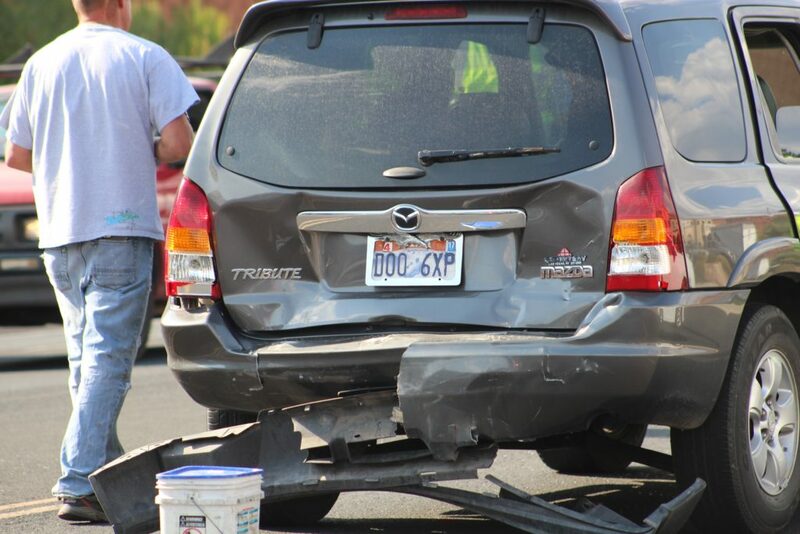 Meanwhile, a gray Mazda traveling behind the Equinox was able to stop in time to avoid a collision, but was rear-ended seconds later by a white Chevrolet pickup truck hauling a trailer. That secondary collision then pushed the Mazda into the Equinox, which collided a second time with the Honda, Ence said, making it appear as though all four cars crashed in a single collision. Minor injuries were reported by the vehicle occupants, but all declined transport to the hospital. 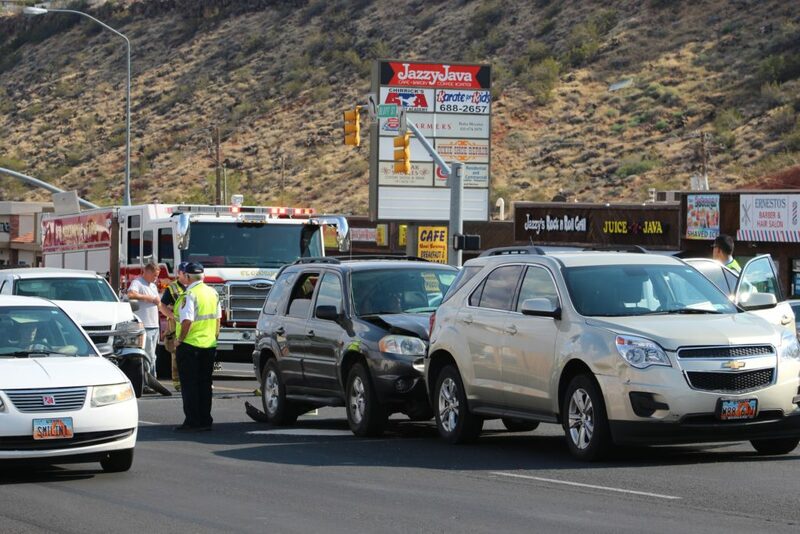 Two citations for following too close were issued shortly after the collision; one to the driver of the Equinox and the second to the man driving the pickup truck. The St. George Police Department, St. George Fire Department, and Gold Cross Ambulance responded and tended to the scene, along with two wreckers which towed the Chevrolet truck and Mazda from the scene. The Honda along with the Equinox were driven from the roadway. Dummy question here , but I thought St G was mostly retirees so related work ( from Non retired ) spread across the day . 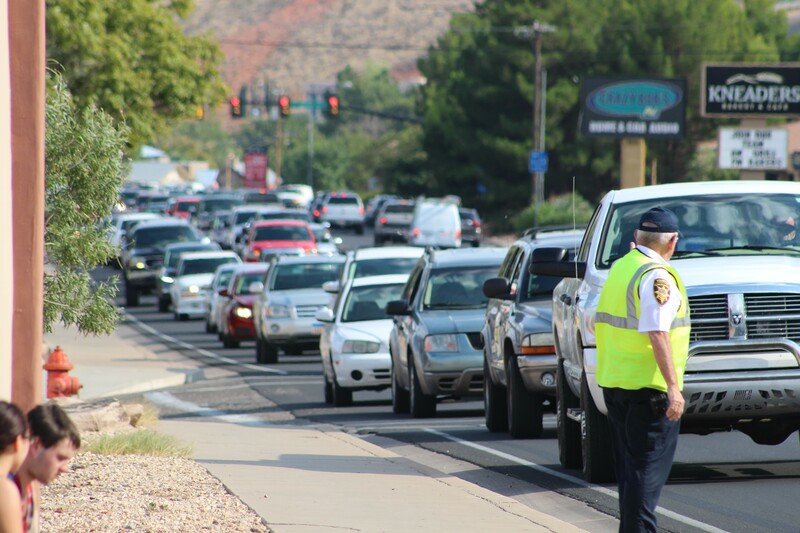 Sooooo , what is the St George “Rush Hour” based on ? What companies have so many employees leaving after 4 pm ? Isn’t it nice that minor traffic accidents, happening daily across the country, are the most noteworthy thing happening here? Come on down: you’ll love the scenery, the weather and the pace of life. It was your fault ! no it wasn’t ! yes it was ! was not ! yes it was ! it was her fault ! was not ! yes it was ! It wasn’t my fault ! yes it was ! it was his fault ! no it wasn’t ! yes it was ! I’m calling the cops ! go ahead ! I’m calling them also ! go ahead !… hey who hit my car ? he did ! no I didn’t he did ! I did not ! she hit your car ! no I didn’t ! yes you did ! Bluff st is so bad… I don,t even travel there anymore..many people Don,t realize the speed limit is too high, and Don,t pay attention, yeswe have peak traffic times.. I don,t travel from 10 before anyhour 8 or 9!!!! Everyone is rushing to work.. And stay away 11:30-1 daily. And aNytime 4-6 pm especially bluff st.. Forget River rd.. It’s busy all the time.. And they are building more stores and hospitol doubling its size. .. Where will the traffic go.. Does the city study traffic patterns.. I moved here 20 yrs ago,, and have seen many changes, ut people have yo adapt to changes and pay more attention, driving defensively ..eat at home or a restaurant. Instead behind the starting wheel….think people..
i’m not even trying to insult you, but really.. what’s your excuse? whenever I read one of your comments it’s like being whacked in the head with a club. Gee, Bob, seems like your primary purpose was to insult, followed by placing much of your own personal baggage into the fray. Relax, you’ll get where you were going with a little patience. Lmao.. Bob attacks someone for their comments and Bob is the one the posts a comment claiming Orrin Hatch is a polygamist. LOL !